Folks in the Western Hemisphere who are just waking up might be wondering what the hell is going on with North Korea and Japan. The short answer: Everybody is preparing for war. Secretary of State Rex Tillerson has said that the US won’t rule out a preemptive strike against North Korea; the North Koreans have said that they’ll use their own nukes if a single shot is fired in their direction; and the Japanese just launched a new spy satellite and are running civilian evacuation drills. Below we have a run-down of all the saber rattling that occurred while you were sleeping. Secretary of State Rex Tillerson visited the DMZ today and has declared that preemptive military action is a possibility if North Korea continues on a war footing, despite reassurances earlier in the week that the country “need not fear” aggression from the US or Japan. Tillerson has said that the current sanctions against North Korea aren’t working as a deterrent against the country developing nuclear weapons and that a new approach is needed. When Tillerson was asked today by reporters about the possibility of a preemptive military strike against North Korea, he didn’t rule it out. “If they elevate the threat of their weapons programs to a level that we believe requires action, that option is on the table,” Tillerson said. Tillerson heads to China on Saturday, a country that has traditionally backed North Korea, but has distanced itself in subtle ways after the most recent missile tests conducted by the regime. Japan launched a spy satellite today, just a week after North Korea launched four ballistic missiles into the Sea of Japan, showing its ability to hit the country from certain distances. 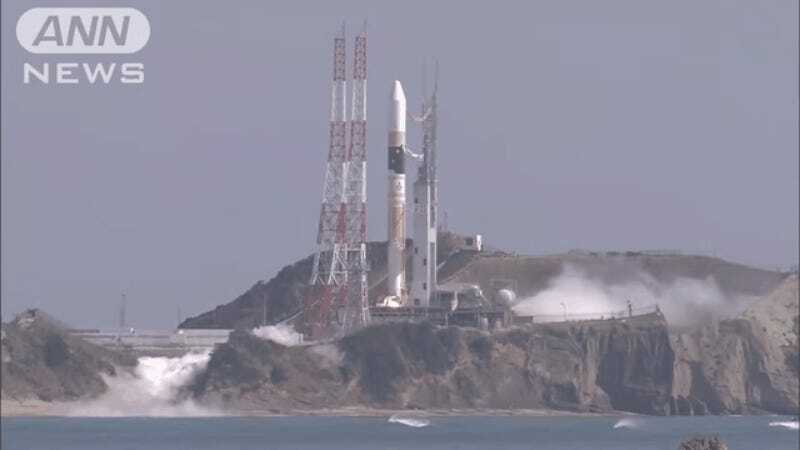 The Japanese Radar 5 spy satellite was launched very publicly today using a H-IIA rocket. Japan already has six known surveillance satellites in orbit, and clearly wants to send a message that not only is it watching from above, but that it has rockets of its own. 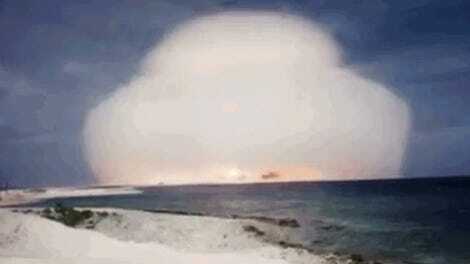 At least that’s our takeaway from all the “peaceful” rocket launches of the First Cold War. As American aircraft carriers are conducting joint drills with South Korean forces this week, North Korea has plainly said that they’ll launch nukes if a single shot is fired in their direction. “The U.S. and the South Korean puppet forces should clearly bear in mind that our warning that if a single bullet is fired into the areas where the sovereignty of the DPRK is exercised, it will blow up the bases of aggression and provocation with the matchless Hwasong artillery pieces mounted with nuclear warheads, is not hot air,” North Korea said in a statement. The long and the short of it? Any attempt at regime change in North Korea, which is something that American officials are openly talking about, could leave a city like Seoul as a hole in the ground first. Japan conducted its first civilian missile evacuation drill in the city of Oga today. Japan is preparing for a potential nuclear strike against the island nation as North Korea continues to demonstrate its ability to reach the country with its missiles. Schoolchildren and the elderly were huddled into gymnasiums and listened as sirens blared throughout the city in a simulated attack. Oga, in the northern part of Japan, is believed to now be within striking distance of North Korea’s nuclear-tipped weapons and the drills are unprecedented, according to the Japanese government. Interpol issued a “red notice” for the four of the seven men believed to be involved in the assassination of Kim Jong Nam, the half-brother of North Korean dictator Kim Jong Un. The “red notice” is the international equivalent of an arrest warrant and should the men be found they’d be extradited. The four men in question are Ri Jae Nam, O Jong Gil, Hong Song Hak, and Ri Ji Hyon, seen in photos above. Kim Jong Nam was killed last month at the Kuala Lumpur airport in Malaysia by two women who rubbed a chemical agent on him. The women said they believed that they taking part in a prank show.